Would you believe me if I told you that I am going to come to your home and help you clean out your closet? I almost don’t believe it, but this is happening! I want to help you simplify your life in real life, starting with your closet. 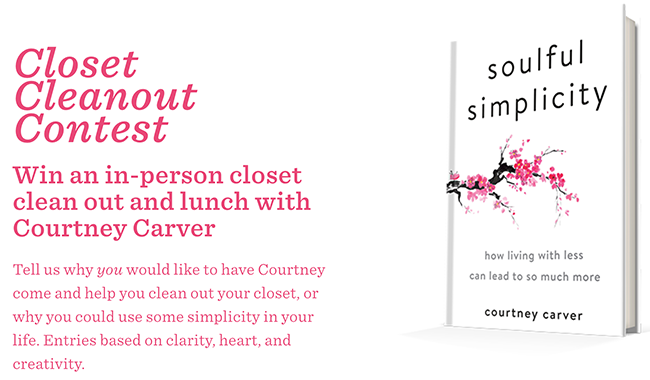 To celebrate the release of my new book Soulful Simplicity, I’m giving away a closet cleanout and lunch in your hometown. If you are familiar with me or my work, you know this closet cleanout won’t really be about the clothes (although we will get the job done). It’s going to be about your life. We’ll talk about the changes you want to make, what’s holding you back and simple ways to move forward. If you just want to focus on the wardrobe though, we can do that too. Another thing to note: this isn’t the beginning of a new business venture for me. I won’t be offering closet cleaning moving forward. In fact, it’s likely this is the only time I’ll do this. After we’ve got your wardrobe pared down and your closet in shape, we’ll celebrate with a nice meal at one of your favorite restaurants. You are welcome to bring a friend along too! What do I have to do to enter? All of the details are here, but in a nutshell … you’ll submit a receipt from your pre-order of Soulful Simplicity and a short essay about why you want to simplify your closet or your life. Am I eligible for the contest and the pre-order bonus gifts? Yep. Sure are. Will you travel anywhere? I would but due to legal requirements, the contest is open in the US only. What if I already ordered the book? Thank you! Your book receipt will work for entry. What if I bought a ticket to the book tour? Thank you! Your ticket receipt will work for entry. Is the contest time sensitive? Yes, very. Please enter by December 16, 2017. When will you announce the winner? Early January. I can’t wait!